Thinking of a buying a bathtub? Congrats, you’ve realized that you need to give yourself some well-deserved relaxation time. A bath is a perfect thing for that. Give yourself some time out to take a nice long soak in the bath. But maybe before you do that, you need to actually buy your bathtub. Use this bathtub buying guide to help you with this important decision. Your bathtub could be old, outdated, or just not go with the style of your home. Worse, you may not have one. Luckily, we’ve got all you need to know about how to choose a bathtub, here. Most homes already come equipped with a shower. Sometimes, when your space is tight, you’ll want to think about combining a bath and a shower together. These are often called shower baths and tend to be P-shaped, where the end for bathing is larger than the shower area. These baths call for shower curtains, too, so you should consider getting a matching curtain that fits with the rest of the decor in the bathroom. There’s an endless number out there for you to choose from. For those who have the space for a freestanding bath, there’s several options and materials to consider. A freestanding bath gives you more freedom when it comes to choosing your bathtub style, but because there are so many options, you might definitely feel like you need a bathtub buying guide. When guests walk into your bathroom and see a freestanding bath, they’ll immediately get a luxurious feel. And, you’ll get to treat yourself to a bath each day. A roll top or slipper bath is one which has curving edges at the top and is probably what comes to mind when you think of a freestanding bath. They’re classic, stylish, comfortable and sleek – just what you’re looking for if you’re decorating a period style room. Corner baths are just what they sound like – baths that you’ll find in the corner of a room. This is a great shape for someone whose bathroom is short on space, or just trying to give their space a unique look. The bath fits in the corner, tucked away but still large enough for a nice soak. Whirlpool baths are more reasonably priced than you might think. Gone are the days where you have to go pay a bunch of money to go to the spa to relax – bring the spa to you when you choose to buy a whirlpool bathtub. With whirlpool baths, you just need to make sure you have plenty of space in your bathroom. This is not the bath for the space-challenged home, but if you do have space, those jets are going to make you feel fancy. You can also get a whirlpool pool if you’re looking to do hydrotherapy. This will definitely up the price of the tub but could be worth it to improve your quality of life. Inset bathtubs are inset into walls in the room, and also help to address the space problem many bathrooms face. They’re decorative and unique and blend naturally into the bathroom. Brassware is where you get truly fancy with your bath. The taps can’t be forgotten, as they’re as integral a part of your bathroom as the bath itself. If you don’t have a tap installed in your wall, you might consider using a floor-standing tap. This brassware comes in a number of styles, from modern to vintage. They add flair to any bathroom and make it easy to set up your bathtub wherever the room calls for it. If you do have a tap already installed, you can renovate it to your liking. You can choose lever handles for your bath tap. The straight and functional handles are the most popular type of tap fixture. Perhaps you want to go with just a single handle and play on the modern look in your bathroom. The water flow is controlled with just a singular handle and adds to a minimalistic look. If you’re in the middle of a bathroom renovation, the material is a huge thing to think about. You’ve got to consider the pros and cons when it comes to selecting the right bathtub material for you. Wood or stone baths may be made from materials like sandstone, marble, onyx, or granite to take your bathtub customization to the next level. Give your bathroom a spa-like feeling if you choose one of these materials, but be certain to make sure your floor can hold the heavyweight. Acrylic or fiberglass are the most traditional, cheapest options that you can go for. Steel bathtubs seem to say, “hey, look at me – I’m impressive.” So if that’s what you want the look of your bathroom to be saying, then, by all means, consider a steel tub. They’re also extremely durable. You can also make a ceramic tile bathtub if you have a less conventional space to fill and are doing a custom job, as it can be molded and designed. 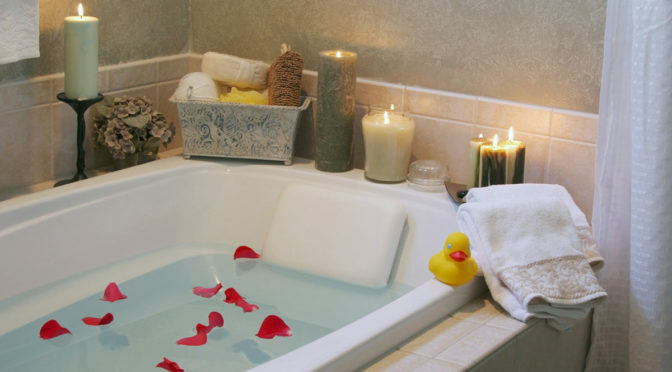 You can read up more on which one is better for you: an acrylic or cast iron bathtub? Now that you’ve read up on it, you’re just about ready to buy a bath of your very own, or maybe renovate the one that you have. Which one and where do you get it, though? Read up on some product reviews so that you can start deciding specifically what bathtub or shower appliance you’re looking for, now that you’ve got a good idea of what bathtub materials might suit your needs the best. When it comes to luxury baths, it’s better to know more than less before you buy. A bath is an investment, and you’ll be glad you did your research. So you will all your achy joints once you finally get to rest them in a warm bath at the end of a long day.